A colour photograph of the Merryweather Steam Fire Engine in the lobby of the Whitby Public Library Central Branch. This view is of the side of the Merryweather. The Merryweather Steam Fire Engine, manufactured in England, served the Town of Whitby for 54 years from November 1872 to 1926 when it was replaced by two motorized fire trucks. It was purchased by the Town after an impressive display of launching a stream of water 145 feet in the air over the weather vane on the steeple of All Saints' Anglican Church. The engine saved downtown Oshawa from destruction by fire on the night of December 8, 1872. 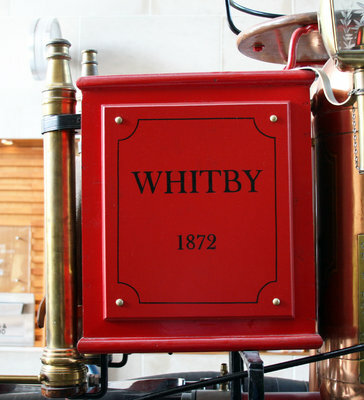 In 1934 the Town of Whitby gave the fire engine to the York Pioneer and Historical Society in Toronto and it was returned to the Town of Whitby in 2005. It is now located in the lobby of Whitby Public Library Central branch. (McGary, Harold. "The Whitby Merryweather Steamer." The York Pioneer 100 (2005):3-13. Merryweather Steam Fire Engine, September 10, 2013, Megan Pugh. Whitby Archives D2013_007_003.